A demonstration of mediumship is an event where a psychic medium stands in front of a group of people, usually on stage, to randomly perform short (three to ten minute) readings for a few of the audience members. Psychic medium demonstrations are basically the same as radio shows where psychic mediums take callers, but this is a live event where people can witness the spirit communication in person. My first experience with psychic medium demonstrations was actually on television. I would watch James Van Praagh, George Anderson, John Edward and Sylvia Browne do their thing on talk shows like Oprah, The Howie Mandel Show, Donny & Marie, Larry King Live and Montel, to name just a few (some shows which have come and gone). During the show, the psychic medium would give mini-readings for studio audience members that would last a few minutes long. They would often tell an audience member things like: their deceased father or grandmother was present; a quick description of what that spirit looked like when living; perhaps what the deceased person did for a job before he or she died; what the cause of death was that took the person’s life (such as an accident or disease); and maybe some sentimental messages like the person was greeted by family members when he or she crossed-over, is happy now in the spirit world, and is watching over that audience member from the other side. Unsurprisingly, these talk-show demonstrations are often unconvincing. Between the hosts who are trying to be funny and the so-called “expert” skeptics whom the producers feel must be heard, there’s a lot of pressure and chaos with which the psychic mediums must deal. Add to this the limiting time constraints between commercials and you have one of the worst conditions possible for clear mediumship. It’s like when you were a kid and your mother was standing behind you telling you to hurry up and pee—not the most ideal circumstances for a satisfying performance. On the other hand, there were occasional television demonstrations that got me thinking in a more convincing manner. I’d ask myself, “How did he know that the audience member lost her daughter to suicide?” “It’s hard to believe he could have guessed her husband’s name is Clarence,” I thought to myself, “I would have guessed John or Bob or David before saying Clarence.” “Of all the illnesses that exist, how did she know his father died from colon cancer and not from lung cancer or a heart attack?” These TV demonstrations didn’t change my life, but they got me thinking about the possibilities; and that was a major breakthrough for this narrow-minded skeptic. The best television demonstrations I have ever seen were on John Edward’s TV program, Crossing Over With John Edward. Edward’s show is what most psychic medium demonstration events are like, only Edward’s demonstrations have television cameras and a crew. I’m pretty sure that the producers for Edward’s show edit out most of the weak readings and show more of his strong readings. That’s what I would do if I were a producer. After all, television is supposed to be entertaining. If you have two hours of demonstration that you must edit down to a half-hour show, who wouldn’t use the best readings? Anyone who would do otherwise would be out of a job fairly quickly. If you ever get to watch John Edward, I highly recommend it. I know psychic mediums who know John personally and swear by his legitimacy. I also know from watching his show and comparing his technique to the psychic mediums I have experienced personally that Edward is an awesome psychic medium. In fact, he is extremely gifted and well practiced in using his gift. He’s not necessarily any more gifted than the psychic mediums I write about in this book, but at the time I write this he is more famous. If you are wondering, I too have heard or read some of the garbage accusations that John Edward is cheating. It’s simply a bunch of crap. Don’t let the media feed you with paranoia. It’s the oldest media trick in the book to increase audience ratings and advertising profits; it’s called sensationalism. 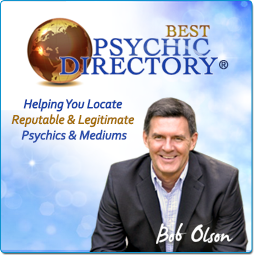 Magazines, newspapers and television tabloids know that skeptics love to think psychic mediums are big cheating scam artists. All they have to do is suggest it and people will jump all over it. 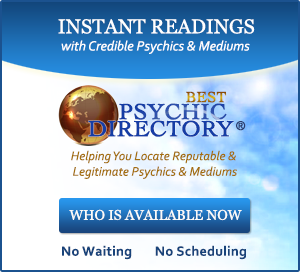 I’m the first person to encourage a healthy skepticism with psychics and psychic mediums. Sadly, there are some fraudulent schemers exploiting the fragile minds of the desperate and bereaved. But TV news shows and magazines are not the authoritative source on this subject. The public should be as wary of the media as they are of the scam artists these reporters seek to expose. I don’t believe it is worth taking down a few truly gifted psychic mediums for the sake of exposing the fakes. The media doesn’t have the experience to know the difference. Television is a good way to be introduced to mediumship, but it will never compare to the experience of attending a live demonstration. There is something magical about anything that’s a live performance. That is why we go to concerts with our favorite musicians even though we have the same songs on CD at home. That is also why we attend seminars, lectures and workshops when we can learn all the same information in a book. Live events are captivating, motivational, and instill a sense of enthusiasm and excitement that are hard to capture through any other forum. One of the best live demonstrations of mediumship I have attended was with two psychic mediums named John Holland and Gordon Smith in Boston, Massachusetts. It was a formal event sponsored by The Ninth House in Arlington, Massachusetts, a holistic health and education center. John is a Boston psychic medium who grew up in Dorchester. Gordon came from his homeland in Scotland to share the stage with John. Both psychic mediums are among the best in the world, and they really know how to present mediumship in an entertaining manner. To avoid confusion, I’m going to focus on John’s performance that evening as an example of a convincing and entertaining psychic medium demonstration. John began the event with a short dialogue about his own personal story and an explanation of how mediumship works. Like most psychics and psychic mediums, John knew he had unusual intuitive abilities even as a child, but his gift was not encouraged by adults so he pushed it away. About a decade ago, John had a car accident while living in Los Angeles. He was banged up a bit in the crash, but no serious injuries resulted. Soon after this accident, John’s psychic medium abilities kicked up a notch—he started to know intimate details about people’s lives whom he had never met. Apparently, the gift he had stuffed away as a child was now resurfacing. He can only speculate that the accident may have had some effect on him to cause this shift in his abilities. John was bartending at the time and began experimenting with his newfound insight into other people’s lives. John would give bar patrons messages as they sat at the bar. Some people loved it and gave John extravagantly generous tips. Others feared his inner knowing and complained to the establishment’s management. Eventually, John’s boss told him he had to stop freaking out the customers. 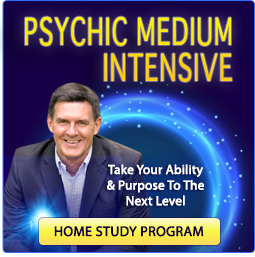 In time, John left that job to study mediumship and improve his gift through proper training. As John told his story at this live event, the crowd was locked on his every word. In only five minutes, he already had guests laughing hysterically one minute and welling up with tears the next. The transition he made from his personal story to his explanation of mediumship was subtle and unnoticed. “Energy cannot die!” he began. Then he gave a compelling discourse showing human essence as energy, not just flesh and bones. John’s explanations were simple and brief, keeping the pace fast and alive. He taught the audience what to expect and what to do if they were chosen to be read. “If I say something that doesn’t make sense, don’t make it fit,” he instructed. “I’m not using a script up here,” he later added, “so this is a lesson in trust for both me and you.” “Psychic medium communication, especially during a demonstration, is all an experiment,” John confessed. “Because I’m not using a script, we can never know what to expect.” Audience members began to squirm in their seats with the spooky thought that, tonight, the spirits were in control. John later explained that many people have already had communication from spirits. “The number one way spirits come through to people is through dreams,” John said. Many audience members nodded their heads as he said it. I could only guess that they’ve had such dreams. “These dreams are unique because they are the dreams you remember with extreme clarity,” John explained. Again, a few heads were nodding in agreement. John finished his talk by informing the crowd of 150 people that the most common message spirits want to convey is “I’m still here!” “They want you to know that they continue to exist and they are still with you,” said John. A few people pulled out the tissues to catch the tears rolling down their cheeks. Just then, the ringing of a cellular phone echoed through the auditorium. “That reminds me,” John spoke with a smile, “Please shut off any pagers or cellular phones.” The phone’s ringing was instantly drowned out by the roar of laughter and applause. Typical of most demonstrations of mediumship, John’s first reading was his weakest. I don’t know if it’s the psychic medium who needs to warm up, the spirits who need to get used to the psychic medium’s energy, or the audience who needs to get used to the format before they shed their initial fears. In any case, it is not uncommon that the first reading of the night will be brief and unconvincing. But then John followed with one of the best readings I have ever witnessed at a demonstration. The audience member he chose was sitting right behind me. To help you understand how psychic mediums choose between audience members, they typically wait to see who comes through from the spirit world. Now if there are 150 people in the audience and each person could have several spirits who want to come through, you can imagine the crowd of spirits competing for the psychic medium’s attention. So while nobody really knows how the spirits decide who is getting through, the psychic medium simply raises his energy to link with spirit and connects with whoever is there. This spirit might be the strongest communicator, the spirit who needs to get through the most (based on knowledge of which we are not privy), or possibly even random luck (although I believe more in fate than luck). Psychic mediums are like a human telephone to the spirit world. Unfortunately, they are a telephone without a dial. A psychic medium can’t call any spirit you want to contact. Essentially, the psychic medium picks up the line and whoever is on the other side (pun intended) is the spirit who comes through. John’s second reading would have caused any nonbeliever to cancel their subscription to Skeptic Magazine. I knew it was going to be a good reading because the woman was immediately emotional. Her voice cracked with sentiment like she was about to start crying right from the get-go. She was full of anticipation and open to anything John was about to tell her—not fearful or sitting with her arms crossed and her mind closed. There must be something to this, because anytime I have witnessed a person being read who is bubbling over with emotion in this manner, the reading is always clear, detailed and accurate. I say this from “my” perspective, not the perspective of the person being read. In other words, a skeptic could argue that such an emotional audience member would naturally feel like they got a good reading because their perceptions are clouded by their high expectations and emotion. But as a third party watching this take place—and as a person who has witnessed many readings both weak and strong with people I personally know (so I know if the psychic medium is accurate)—I’m distanced enough from the reading in both emotion and expectation to remain objective. So my conclusion is that there is a direct connection to the openness and acceptance of the sitter (the person being read) and the accuracy of the reading. On this particular evening, this woman was open and accepting, and John’s reading was remarkably accurate. The woman’s husband, whom she had lost only months prior, came through with detailed and sentimental messages. We learned that they once had an Irish Setter who was now with the husband in the spirit world. We learned that the husband was a smoker, that they had one child together, that he had big ears, that she had recently visited the doctor, that she still kept his watch, that her grandmother named Rose had a stroke, that she often felt the husband lay down beside her in bed at night, and that they shared some of their favorite memories at the beach. My listing these messages in one short paragraph goes a step beyond not doing them justice; it actually deflates the sacredness of the experience. To have been in that room sharing this woman’s confirmation that her husband was there—validating that he continues to be with her each and every day despite the physical limitations—was a poignant and unforgettable event. Her tears, enthusiasm and excitement for every message conveyed indicated to everyone how well John was doing, and had tissues flying out of pockets and pocketbooks. I think most audience members could have gone home after this reading alone and felt satisfied that they had witnessed something that would forever alter their thoughts about spirit communication and the afterlife. But then John slam-dunked another two incredible readings before it was Gordon’s turn to wow the attendees with his mediumship in a Scottish accent. The purpose of a public demonstration of mediumship is not to give everyone in the audience a reading. That is what many attendees hope for when attending a psychic medium demonstration, but this is not a forum for private readings. 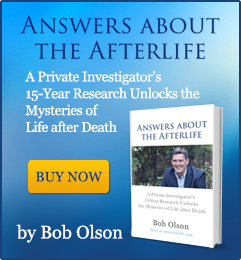 The purpose of a public demonstration is to open people’s minds to the possibilities—the possibility that an afterlife exists and spirit communication is achievable. Demonstrations can also help people overcome their fear of spirit communication. By watching other people receive messages from the other side, fearful audience members may recognize that their fears are based on a lack of knowledge—fear of the unknown. Once these fears have been overcome, some people will be ready for a private reading. For some, psychic medium demonstrations are simply a form of entertainment, something to do on a Friday night. Yet these people are the minority. The majority of attendees have come with a purpose. Some desperately want to communicate with someone they have lost. 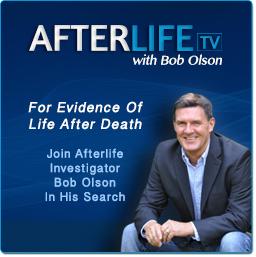 Often, people are seeking proof of an afterlife to know that their loved-ones live on or that they will live on when they reach the end of this lifetime. And some seek insight that will help them to deal with their grief and allow them to move past the bereavement process and back into life. Whatever your reason for attending a demonstration, I highly recommend it. It is one of the most rewarding, educational and thought-provoking experiences you can have on a Friday or Saturday night. Even if you leave the demonstration with remaining skepticism, you will be one step closer to that understanding I call a “knowing.” First we are “skeptics.” Then we become “believers.” And in the end, if we have witnessed enough evidence to overcome a lifetime of limiting beliefs and learned skepticism, we become “knowers”—we know that spirit communication is real and that we survive death.